But this year I thought I’d mix things up a bit. 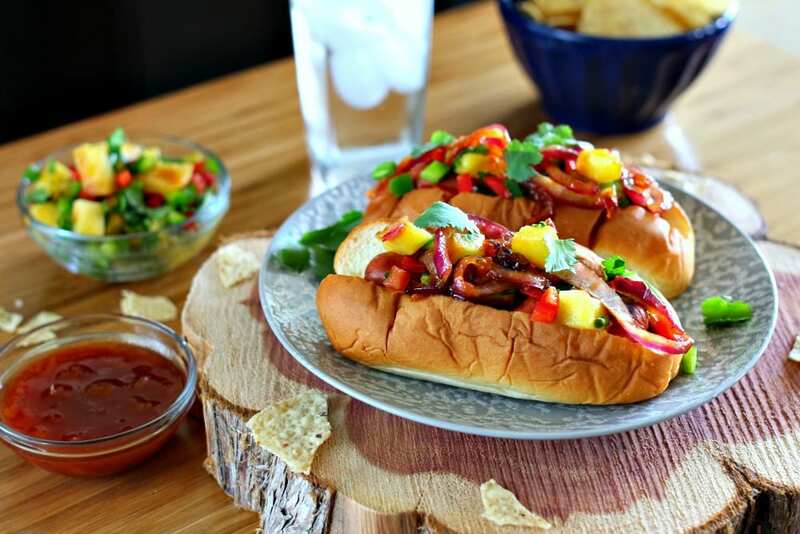 Instead of sliders, I headed to my local HEB and picked up KING’S HAWAIIAN® Hot Dog buns in the bakery section for the base of my little creation – Aloha Dogs. 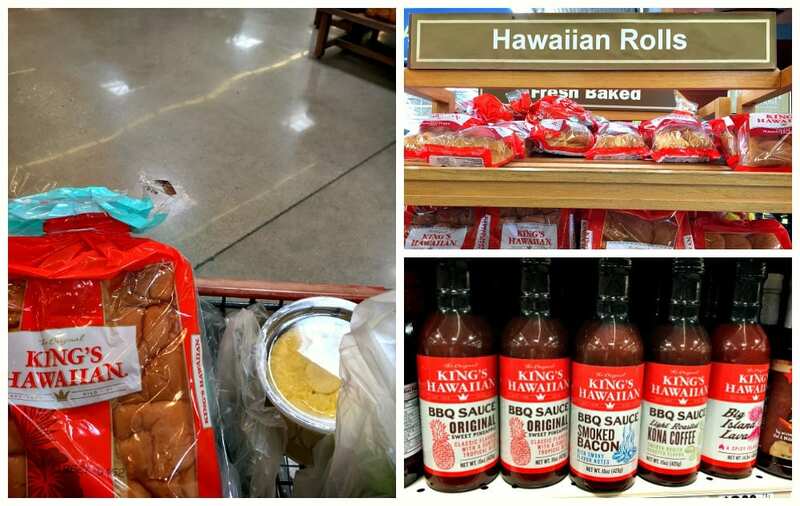 Did you know KING’S HAWAIIAN® has BBQ sauces? They do and they’re incredible. The Original Sweet Pineapple BBQ sauce has a bold BBQ flavor with a sweet bite from the pineapple. It was exactly what these hot dogs needed. 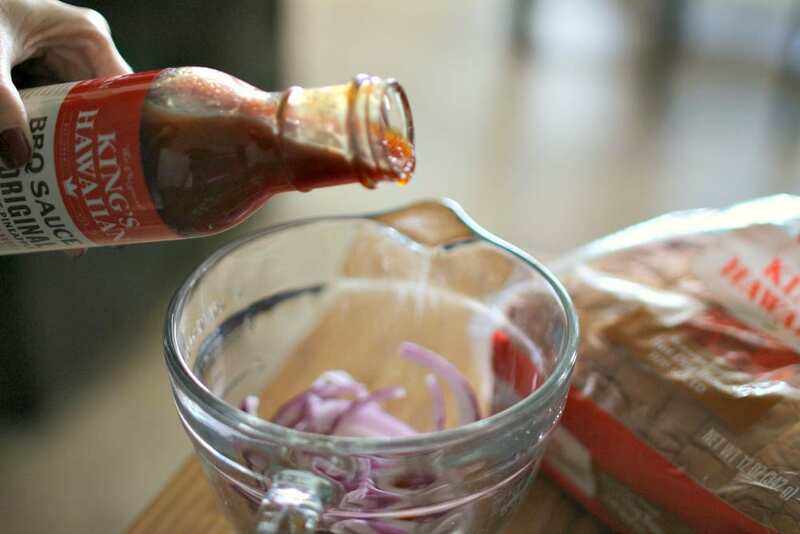 Mix slices of red onion with the KING’S HAWAIIAN® Original Sweet Pineapple BBQ Sauce. Cook the red onions in a cast iron skillet, which will give them a little bit of char. After the onions have cooked for 2 to 3 minutes, push them to the side and add the pineapple rounds (I used fresh, not canned). Cook them for about 2 minutes per side until they get nice and brown. Set the red onions aside. 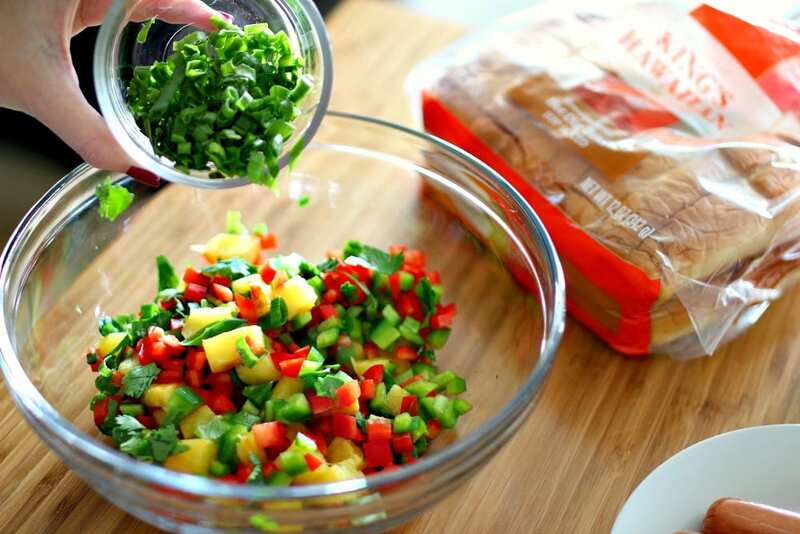 Cut the pineapple rounds into small chunks and mix with the chopped green onions, green pepper, red pepper and cilantro. This is your pineapple salsa and let me tell you, it’s incredible and full of flavor. To assemble the Aloha Dogs, place a hot dog in a hot dog bun. Then scoop on top some of the pineapple salsa and the red onions you mixed with the BBQ sauce. Get ready for a flavor explosion! 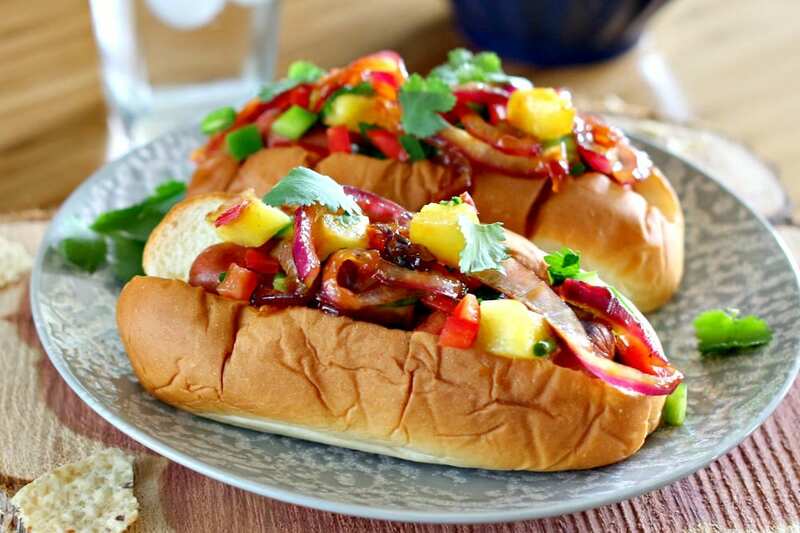 The sweetness of the red onion/BBQ mixture plus the crunch from the pineapple salsa plus the softness of the KING’S HAWAIIAN® Hot Dog Buns make this one amazing meal. You can also add a little bit more BBQ sauce on top of the hot dogs, which is what my husband did. Are you ready to grab an Aloha Dog and cheer on your favorite team? I know I am! I also know I’ll be making these again and sharing with family & friends. Here’s your printable recipe. Enjoy! 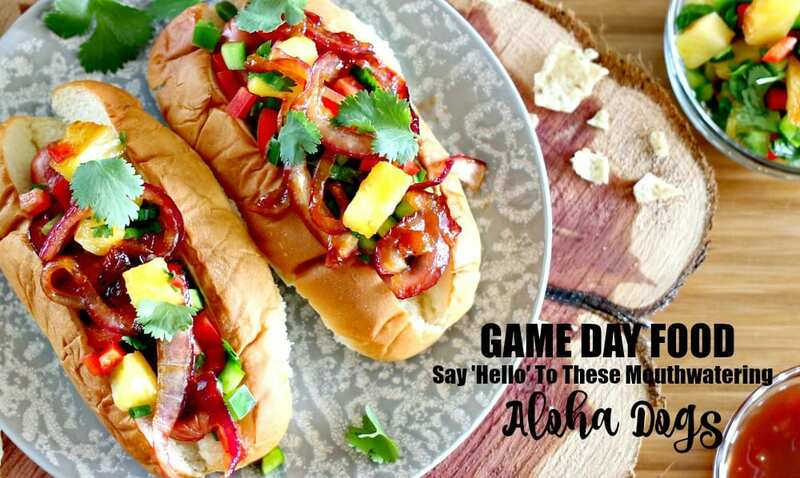 These Aloha Dogs are the perfect Game Day food. 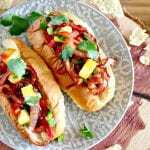 Gather up the football fans, turn on the TV and get ready for everyone to inhale these mouthwatering and super easy to prepare Hawaiian hot dogs. 1. Slice and dice all ingredients for the pineapple salsa, except the pineapple and put into a bowl; set aside. 2. Slice the red onion into rounds and mix with the 1/4 cup BBQ sauce. 3. 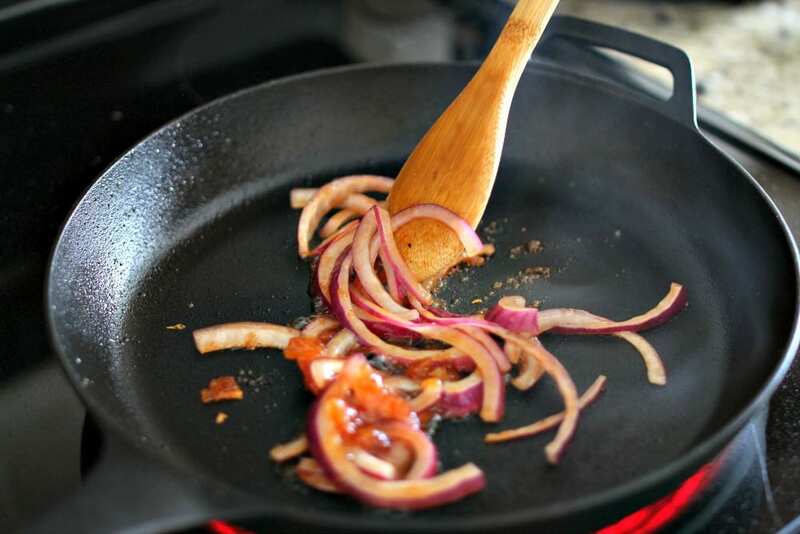 Cook the red onion mixture in a cast iron skillet for 2 to 3 minutes, or until they start to get a char. Set aside. 4. 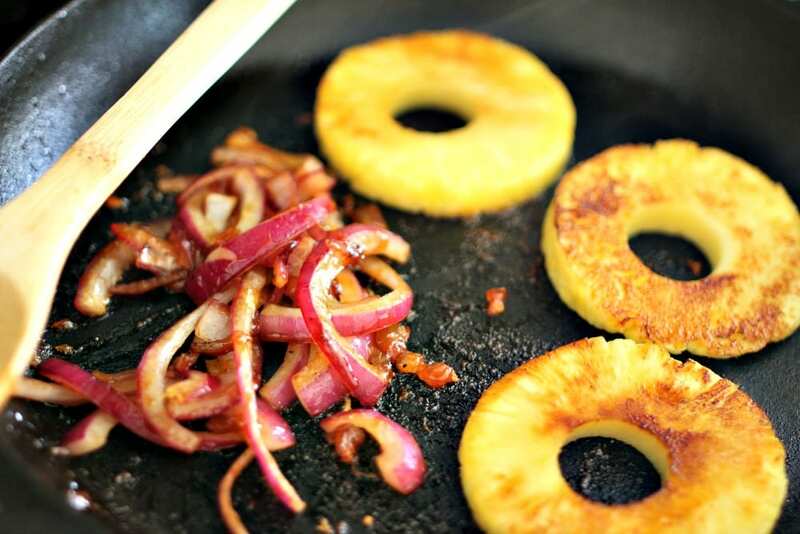 Add the pineapple rounds to the skillet; cook for 2 to 3 minutes per side until they brown. 5. Cut up pineapple into chunks and add to the diced green pepper, red pepper, green onion, cilantro mixture. 6. Grill the hot dogs. 7. 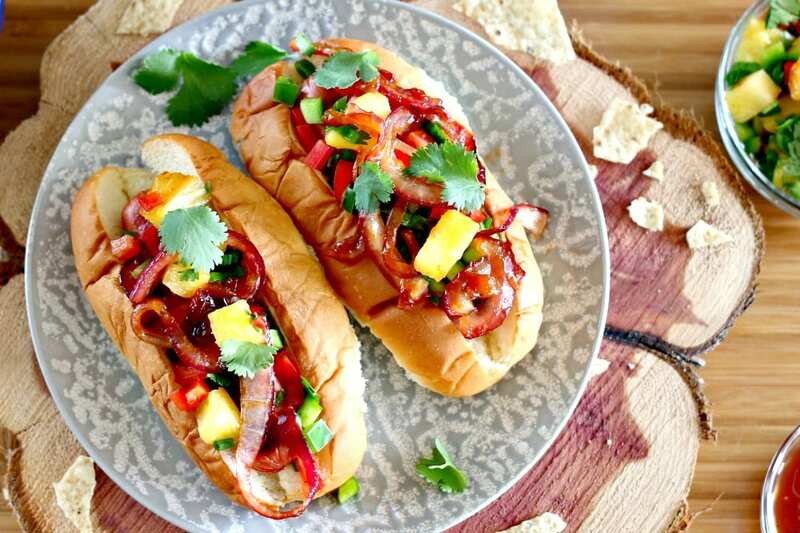 To assemble the hot dogs, place a grilled hot dog on a hot dog bun and scoop on some pineapple salsa and red onion mixture. 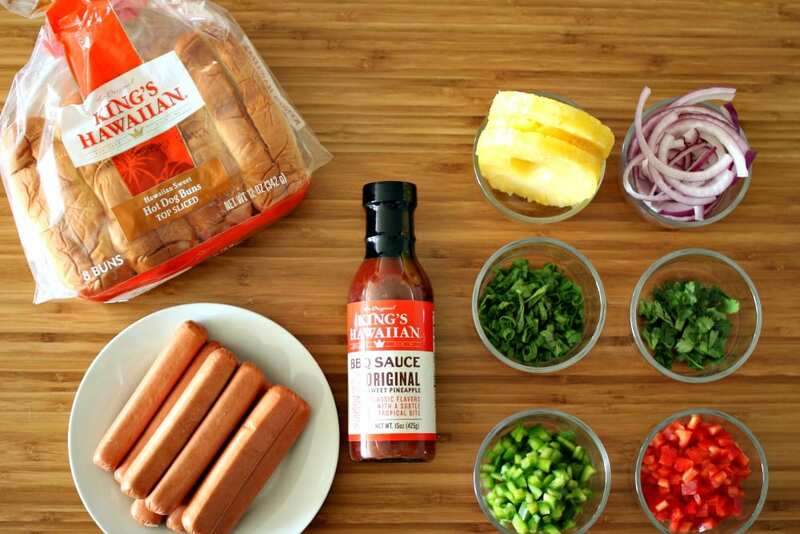 You can assemble these hot dogs on a tray so your party guests can just grab and go. 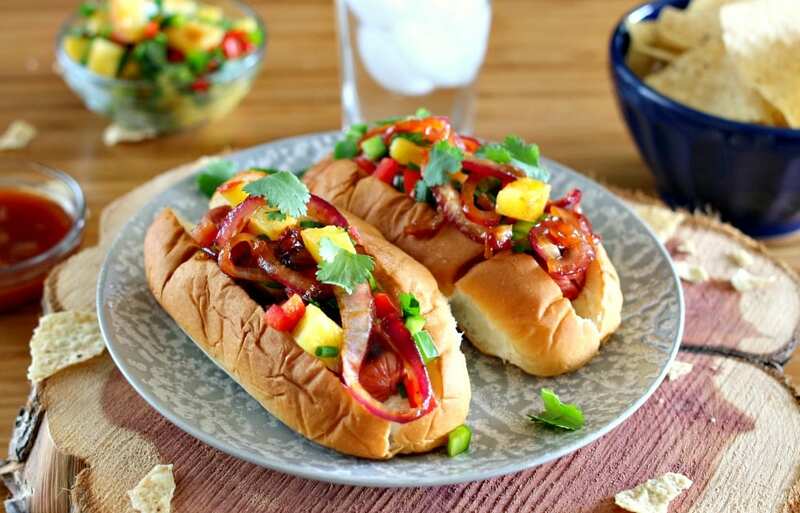 Have a dish of the pineapple BBQ sauce handy for people who want to add it to their hot dogs.